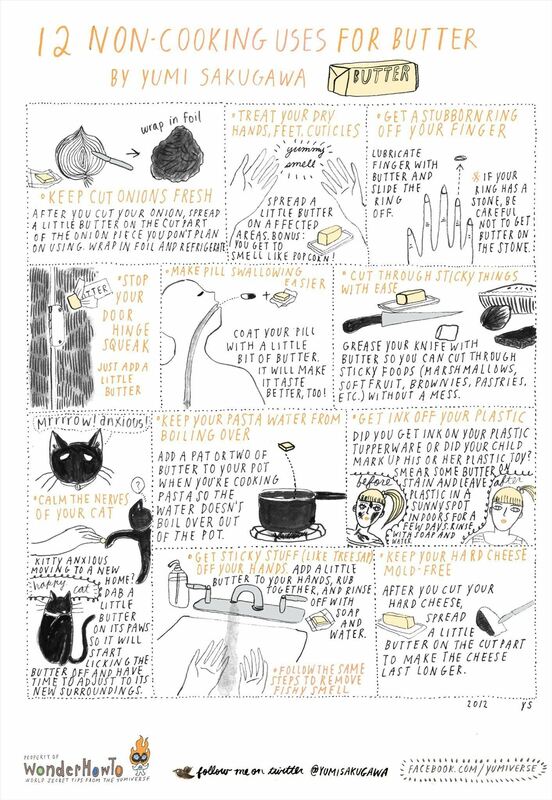 Though it may seem like sacrilege for some to use butter for something other than to flavor your food with delicious buttery goodness, butter has many other surprisingly practical uses, like keeping your hard cheeses mold-free or helping you swallow your pills. The oily, slippery quality of butter is perfect for stopping your door hinge squeak, lubricating your knife to easily cut through sticky foods, and to slide a ring off your finger. If you love the taste of butter (and who doesn't? ), have you ever considered that your cat would love the taste of butter, too? If you are ever moving your beloved feline to a new home or you want your cat to feel comfortable around new house guests, dab a bit of butter on your cat's front paws to calm its nerves. May work for humans, too. Got your own weird uses for butter? Share with us by commenting below. Oops, still 12! I forgot to color-code the 12th tip, which is the tip for removing fishy odors from your hands. Image updated.